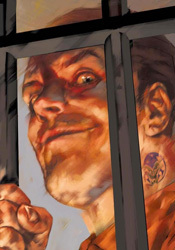 Norman Osborn has stagnated fairly significantly over the past year. Not that one could blame him, being confined to just ten square feet of cell space in one of the back corners of the Raft, floating home to Marvel’s criminally insane and maniacally dangerous. The ex-Green Goblin hasn’t been without his share of visitors since the Avengers forcibly removed him from power in Siege, but for the most part he’s been left to spend some time with his own thoughts. As it turns out, that might be all the company he needs, what with the pair of strong-willed personalities crammed in there, each vying for control of his mind and body. I can get that considering his static locale and lack of company, Norman himself isn’t the most likely candidate for a starring role in his own limited series right now. No matter how fascinating his psyche may be, readers aren’t going to stream through the doors to follow the adventures of the firmly incarcerated man and his active imagination. As a means to keep this series from becoming a single-perspective series of internal monologues, writer Kelly Sue Deconnick has sent us off to a small handful of locations around the globe with at least one thing in common: a subject of conversation. If you imagined that topic as Norman himself, I’ll be around to deliver a cookie shortly. Although his finger is no longer on the button, it seems the Goblin is still a popular subject of debate in various military, press and religious circles, and for at least one day we get to play flies on the wall. Bearing that in mind, it still feels quite odd to read a book titled Osborn in which Norman himself has only a few very brief appearances. Understandably, it’s the first issue of the series and Deconnick spends most of her time setting up the pins so forthcoming issues have something to bowl over, but at the end of the day it’s still the villain who has the most intriguing persona of the lot and his regular presence is sorely missed. Deconnick’s temporary partner, artist Emma Rios, left me something more to be desired. Her work dances a fine line between frantic and over-composed, neglecting detail in certain circumstances and pouring it on in others. Her take on the story’s few recognizable characters (namely Peter Parker, Ben Urich and Norman himself) are foreign and unfamiliar, a trend that continues when she moves to take on the issue’s new faces. There’s no sense of adventure or excitement in her work, not that the word-heavy situations she’s illustrating have much call for that, but that gives her art a bland, drawn-out personality. Rios seems like a fill-in artist who’s missing her opportunity to turn a few heads as a regular. Her page layouts are easy to follow and clean enough, but the artwork itself is stale, faceless and dry. I once thought that Osborn himself was the key to any issue’s success. With such a deep, rich, charismatic character already defined beforehand, I was certain that any story could find new life by merely including him. And for some time, that little theory of mine held up. Different writers and different titles all tried Norman on for size, and with very little exception, each came out smelling like roses. Odd, then, that it’s the Goblin’s own self-titled mini-series that kills it for me. Despite its promise and the character’s long string of success stories, this story just isn’t a winner. It’s slow moving, witless and predictable, three traits I never thought I’d assign to anything involving the former head of the New Avengers. Skip it.